Dayton is perfectly situated within 500 miles of 60% of the population of the U.S., making it one of only two Centroids in the United States. 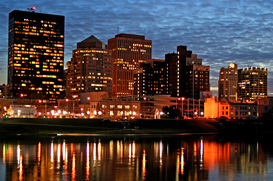 Due in part to Wright Patterson Airforce Base, Dayton plays host to significant industrial, aerospace, and technological/engineering research activity and is known for the many technical innovations and inventions developed here. Famous inventors such as the Wright Brothers, Charles F. Kettering, and numerous others assist in Dayton being cited by the National Park Service based on information obtained through the U.S. Patent Office as having more patents granted per capita than any other U.S. city. Much of this innovation is also due in part to Wright-Patterson Air Force Base and its place within the community. In addition to defense and aerospace, healthcare accounts for much of the Dayton area’s economy. In 2011, Dayton was rated the #3 city in the nation out of the top 50 cities in the United States by HealthGrades for excellence in health care. Many hospitals in the Dayton area are consistently ranked by Forbes, U.S. News & World Report, and HealthGrades for clinical excellence. Dayton is also noted for its association with aviation; the city is home to the National Museum of the United States Air Force. Orville Wright, poet Paul Laurence Dunbar, and entrepreneur John H. Patterson were born in Dayton. In 2008, 2009, and 2010, Site Selection magazine ranked Dayton the #1 mid sized metropolitan area in the nation for economic development. Also, in 2010, Dayton was ranked one of the best places in the United States for college graduates to find a job, according to Bloomberg Businessweek. Founded in 1796, the city was incorporated in 1805 and was named after Jonathan Dayton, who owned the land. Dayton had been a captain in the American Revolutionary War and was a signer of the U.S. Constitution. Welcome home…We’ve been expecting you!